This was the first sign for The Cave; it was just temporary. This darkride would startle, mystify and enchant, over and over again. The concept of this dark-ride design was a short-lived and lost art. It defied definition... until perhaps now. Imagine stepping into a small oval-shaped fiberglass boat, with two to four other people, straddling a padded, naugahyde-covered seat running front to back in the center. Imagine this boat beginning to move with the water current in a narrow concrete "river". The river carries your boat into a small rock "cave" opening. It's very dark and cool as you leave the hot, humid Texas summer behind. Total darkness. Then things start to get weird. You hear mysterious, eerie music. Glowing, colorful, black-lighted scenesstart to appear, though it still remains plenty dark enough that you cannotsee where the ever-winding water path is taking you. This is an artificial cave where scenes are divided into grottos separated by small, archedopenings in the cave "walls" through which the river flows. Odd-looking creatures with tiny bodies and oversized, stalactite-shaped heads are busy along the banks of this underground river as they entertain, play and work. 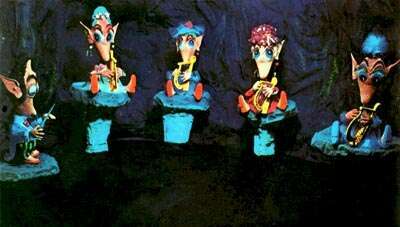 Just looking at these beings (called Spee-Lunkers) provokes a strange feeling deep within guests. The Spee-Lunkers stare with bulging eyes andheavy rolls of skin around the eyes. Their tiny mouth appears to be at the bottom of what is an elongated, "bill" like face. They also have large, pointed "stalagmite" shaped ears. Though weird-looking, these creatureshave a human quality. Some have described them as "grotesquely cute". The first scene upon entering the darkness appears to be two Spee-Lunkers to our left, watching guests as they arrive. Next on the right, a "Spee" sits with flat rock"tablet" between it's legs as it slowly hammers a chisel into the rock. We hear mysterious music and the ringing sound of the hammer onto a chisel. Is the Spee counting guests? Making a passenger manifest? The audio was always out-of-sync with the animation. This was remedied later when they removed the ringing from the tape and integrated it into the animation mechanism. This isa replacement Spee. A few seconds of an 8mm movie of the 1960's version of this scene showed this Spee was wearing what looked like a cone-shaped sorcerer's hat covered with moons and stars. 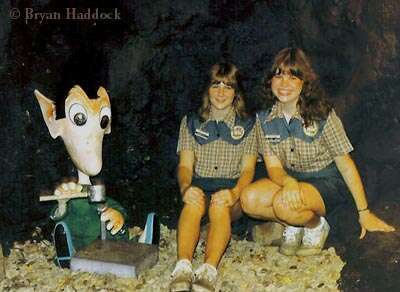 This and the other ride operator photo's were taken in 1984. 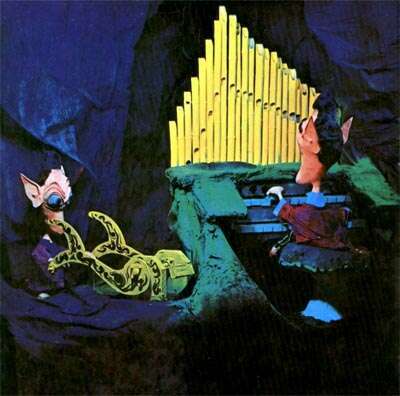 1984 version of the pipe organ scene. The water-path is moving left to right in this picture. To the right you can see under the arch into the next grotto which is around the bend. That scene contains the "fishing Spee" shown in more detail below. Up ahead we are entertainedby a Spee playing an organ as a little Spee operates the "pump" for the organ. A cheerful calliope sound emerges above the bizarre musical mixwith the previous scene as we watch children Spees riding turtles in a circle in and out of a little opening in the cave wall. 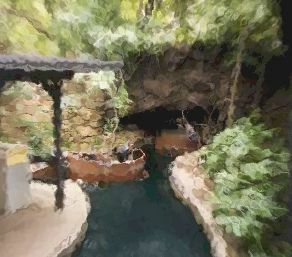 Other similar playful activities are taking place in this grotto. Next we see a Spee fishing in a little cave pond accompanied by the sound of large, almost musical drops of water into the pond. Notice the blue worm on the end of the line. Do this Spee's pupils seem to be in the shape of a bat? A flock of bats to our right seem to be "advancing in place" toward us as they flap their wings. Then we see a giant idolcarved into the cave wall. On the left, a Spee is holding a whip in onehand and leashes in the other which are attached to "slave" lobsters as they work to drag grinding stones back and forth. This whole grotto is accompanied by an intriguing rhythmic arrangement of Tabu. In the next grotto, classical harp music is heard as four Spee harpists, sitting on mushrooms, follow their conductor who is standing on a mushroom. And then we enter another grotto where four orso Spee's are doing "the twist" to a daffy, peppy saxophone arrangement.The exit to this grotto has a big hairy arm rising and falling above our heads as if we need to dodge it so it won't grab us. If the hairy arm doesn't get us, the giant spider next to it will! By this time, thoughts in guests minds resemble a famous line in a movie; "... I have a feeling we're not in Kansas any more." As we leave this grotto, things start to change. After being entertained by busy Spee-Lunkers, the barrage of eerily out-of-tune musical cacophony fades away as it gets very dark. We feel our boats beinglifted up an incline. An appropriate musical theme indicates danger ahead.About 20 yards straight ahead, we see two Spee-Lunkers in a floating tubas it rocks back and forth. They both have on snorkeling masks. We are no longer climbing but begin speeding downward to below the apparent "waterlevel" of the floating tub. We realize now we are not sinking, but instead are plunging down a cave waterfall. Just around a bend, we see a Spee-Lunker fighting a swordfish with a sword! To the right, a peg-leg Spee is opening a treasure-chest. This was a changing gag. During a gasoline shortage, it contained gascans. During a coffee shortage, it contained coffee cans. Still very dark, there is a subtle suggestion that we have exited the cave at night. Surrounded by total darkness, thunderis heard ahead and within seconds, we find our little river has openedon the coast where a wild thunder storm is in progress as we see several alternating bolts of lightning (made of "neon" lights with painted over-laysto conceal them until they illuminate.) The lightning is suspended justbehind a mural of night clouds painted with fluorescent pigments gently illuminated by black-lights. As we travel through this storm, we notice a Spee-Lunker resembling Benjamin Franklin standing on land, flying a kite with a key attached to the string. The current takes our boat toward a wrecked sailing ship. The slowly-rocking hull has a hole torn in it and as you might imagine, we are headed for that hole! Inside the hull, it is dark and creepy aswe approach the sound of creaking timbers. Our river takes us right into a dark, badly damaged part of the ship where large timbers on both sidesof us are pivoting at the bottom and "loose" at the top as if they might fall on us. There is a serious, loud, deep groaning sound as they rockand sway, but we safely escape. Ahead on the right is the ship's brig. A man laying on a cot is playing "sailor's hornpipe" on a concertina (squeeze-box). A Spee is seated across a table from another man playing cards. Another Spee is sawing away at the jail bars in an attempt to escape. The entire brig scene is rocking to remind us we are still inside the ship. A turn to the left and we encounter the old "rotating barrel" vertigo gag. Actually, it is made to look more like pieces of the ship rather than a barrel. Suspended in darkness and encompassing our little river, the inside of this large "barrel" is dimly lit with yellow light. Of course, we feel like we are turning upside-down. The barrelseems to imply that the ship is spinning around us (or we are spinning inside the ship) as it may have been lifted by a hurricane in the Gulf Coast. That's about as good an explanation as any to excuse what follows. We now find ourselves entering from darkness, an arctic blizzard, or a mountain blizzard (I guess the hurricane tossed the ship there where our little tub-boats floated out) as we are sprayedwith a mist of water, then a blast of cold air. This scene is lit with a bluish-white light and actually has a snow-making machine on one side to create the "blizzard". Brrrrr! It's very cold here. The sound of violent howling wind spices up this scene. As we leave the scene, we are againblasted with a water mist, then cold air. Then around a light-trap andout into the hot Texas summer heat as we pause at the off-load dock. What just happened to me? This was all just too weird. When one rides it for the first time, they soon have to go back again, just to try and figure it out. This was no ordinary darkride. Some darkrides try to attain realism, others fantasy, this one was, well, fantasy but beyond that, it was more like a Technicolor dream. It had a very surrealistic feel. It contained mysteries that it did not attempt to answer. Guests did not really know how to describe it. "Enchanting", "refreshing", "cool", "odd", "weird", "mysterious", "musical", "campy", "magical" "bizarre", were some of the words people included when describing this mesmerizing ride. This wonderful darkride was inspired by Angus Wynn, Six Flags Over Texas founder and president. It was designed by Randal Duell & Associates, who themed the original Six Flags, which was the very first regional theme park. Duell was an architect specializing in movie set design. He was production designer for several movies from the 40's and 50's including "Singing In The Rain". The old Six Flags of the 1960's looked like a giant movie set. As you moved through the park, everyturn would surprise you as the sets pulled you into another place and another time, producing an exhilarating sense of adventure. The Spee-Lunker character was the creative genius of Walter McKeegan who was art director for "The Lucy Show" and later for Filmways Television on such shows as, "Green Acres", "Petticoat Junction", "The Beverly Hillbillies" as well as M*A*S*H and others. The scenes, gags and soundtrack production were designed by Gene Patrick who was from the Arlington, Texas area. Fabrication of the Spee-Lunkers,props, sets and scenes was all done in Arlington, Texas. I spoke withPatrick in late 2001 briefly by phone. I had many questions, but I believewhat really stayed with me was his response to a comment I made about a major revision Six Flags made to the ride in about 1980 and later. I thought the new additions were cute and cleaver, but they just did not fit and actually canceled the "magic" of the original ride. "If you try to slick it over, it won't work", was his comment. He was right. The original ride was illuminated by black-lights and fluorescent pigments with the exception of the rotating barrel and snowstorm scene. All the props and sets were suspended in darkness and separated by large voids. The cave walls were very subdued. Even the rocking timbers were spaced apart in a background "infinite" darkness. Resist the temptation to fill in the voids and over-illuminate the scenes! The light level was perfect in the original design. The only exception was when I would ride after dark as my eyes were night sensitive. At that time, I could seea little more than what I was supposed to. How did it all begin? At that time, new caves were being discovered and explored in Texas. Someone on the Six Flags staff suggested a man-made cave ride, to commemorate cave "spelunking" in Texas and perhaps, to give guests a place to cool off in those extreme Texas summers. An artificial cave would not be very interesting. Both Randal Duell and Angus Wynn did not believe this ride would amount to anything. Then the Spee-Lunker character was developed. That led to designing the scenes and gags around these willing Spee-Lunker characters. This is one of those things that you cannot design success into. It just happens. Everyone involved was very talented, but I believe they all surprised themselves. The ride was either just completed or nearing completion atthe time President Kennedy was assassinated just a few short miles away. "The Cave" pierced a hole through the ordinary and allowed a little magic to ooze up into the park from it's luring spot. That's it. It was magic. Just it's very presence in the park and in the back of our minds "electrified" the whole park no matter where we were or what we were doing at Six Flags. This ride was removed in 1991 and replaced by a Warner Brothers themed ride with Loony Tunes characters. It used the same water-path and building. The current ride has some nifty sets, but is no match for The Spee-Lunker Cave as many have testified. "It was probably the worst time I ever went to Six Flags, when I realized The Cave as I knew it was gone." "Something about those little guys and the cave atmosphere in general that made it a must-ride." "Since the Spelunker's absence, the park seems a little lacking somehow." "I am devastated by the news that the Cave is no more." "All I have to say is that when I went to look for the Cave and found out it had been replaced, I literally cried." "Even though it was not big on heavy technical effects, the ride to me blew "It's a Small World" out of the water (Spee was on the fun side not the annoying)." "Everyone used to get off excited - even after riding over and over!" All the revealing comments are just too numerousto post here. My own infatuation with this ride as a youth caused me tocommit it to memory. Not only do I still remember the scenes and sequencesin which they appear, I also remember the music and sounds. The ride has almost cult status. 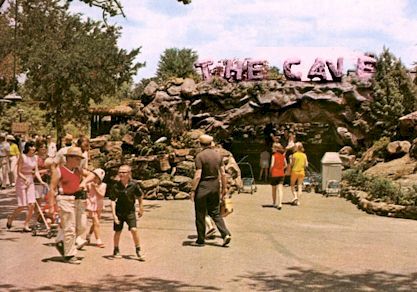 Even though is has been gone since 1991, reading and listening to comments of hundreds of people who grew up with Six Flags Over Texas, The Spee-Lunker Cave has made a strong, indelible impression on them. It still lives deep down inside millions of people from many states who experienced The Cave. There is an eBay user called "speelunker" and another called "speeelunker". I know for sure that at least the last one was thinking of this ride when choosing that user name. One fan says they will travel the 1,500 miles required to see this ride were it ever re-built. How many others would do the same? The ride was not big on special effects, but somehowthat did not matter. Here is a clue why: special effects experts say the movie "Forest Gump" had well over 100 superb special effects, though itis not known as a showy special effects movie. These powerful effects did not serve to draw attention to themselves as in some movies, but rather to support and reinforce the story seamlessly without being noticed separately. Inversely, the Spee-Lunker Cave had no big special effects. The animations were single-jointed using reciprocating air cylinders or a simple rotating motion with no external control and regular, self-timed repeating movements. That did not matter. It's lack of intricate animation and special effects was diminished by the clever flow of activity, the theme, the scenes and gags, the music and sounds, and how the overall design brought it alltogether. Even if it were built today, very few technology upgrades would be necessary. The special "feel" of the ride must be captured, though. Those oval fiberglass boats were used throughout it's duration with one exception. An early photo and a few seconds of 8mm movie film reveal the ride opened with a different boat. These were round in shape surrounded by a small bumper. Apparently, when the boats came in contact with the flume edges, they would go into a gentle, slowspin to disorient guests. They were replaced by the oval boats sometimebetween 1964 and 1966. I do not yet know why the boats were changed. Capacity may have been the reason. With the round boats, you could fit only three adults and maybe squeeze a small child in. With the oval boats, 4 adultseasily fit with room to spare. Six little kids could fit in one oval boat. One person who rode the round boats during the first year commented: "the (replacement) boats never had the same magic afterwards". I wish I had tried them out. The oval boats had submerged, horizontal rubber wheels at each "corner" that would contact the flume-sides to roughly keep the boats' front in the forward direction. They had a fist-sized post extending up at each corner to assist passengers seating and for employees to handle the boat when necessary. The boats were just narrow enough that there was a nice, fun "bump" as the little wheels would hit the winding sides as the concrete flume changed direction. At the time The Cave was removed, the oval boats were ganged in two's. There was a rod that connected the front of one to the rear of another. This may have been to increase hourly capacity and to improve stability. 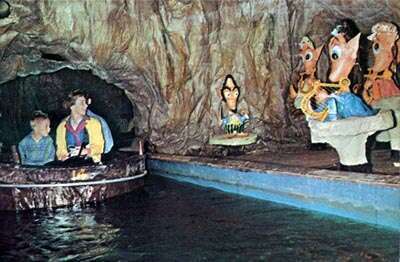 To this day, the "Yosemite Sam's" ride uses the ganged oval boats. The seating has been changed from one center front-to-back,to two side-to-side seats. As far as I can remember, there was always a blue dye added to the water! Originally, the animations were powered by electric motors with crank or cam movements. Sometime between 1967 and 1968 they were converted to pneumatic. This looked better although slightly noisy. I'm sure this greatly cut back on electricity usage. Also, placing electric motors inside or near animated objects is a fire hazard. There were at least 20 channels of sound throughout the ride, many in stereo, which was a new recording technique back then. Patrick said this many channels of sound in a darkride was unheard of back in 1964. A former employee of the park who's job it was to duplicate replacement working audio tapes for the various park attractions, said The Spee-LunkerCave used music and sound loops for each scene that lasted about 20 to 30 seconds, then repeated. They were played back on stereo reel to reel 7.5 inch tape machines. The tapes would run for about 30 minutes on one side, then auto-reverse to the next side over and over all day long: very maintenance intensive. Now, the same thing can be accomplished with rack-mounted, multi-track digital audio players using flash-memory. A most unusual and powerful thing about the sound mix in The Spee-Lunker Cave is that as you moved in and out of each grotto, the music would fade and shadow over each other. A music loop always had an off-pitch relative to that in the next scene. Each piece of music would seem to morph into a different musical statement as it mixed with the music in the scene in front or behind it! A very strange sensation! To this day, I do not know if this aural illusion was intentional or accidental. Perhaps this is one of several characteristics that would make this ride more difficult to replicate than it was to design originally. I have actually created a "ride-through" audio mix of the music and sound effects of this ride and I believe I have captured much of the magical "feel" as far as just the sound itself, including the aural illusion described above. It contains some of the original musicand sounds. What originals I could not locate, I carefully auditioned and substituted very close replacements. 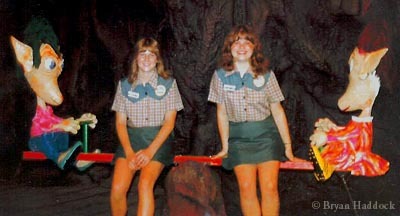 I have also documented in detail, what I remember of the scenes as well as observations on what made this ride "work". 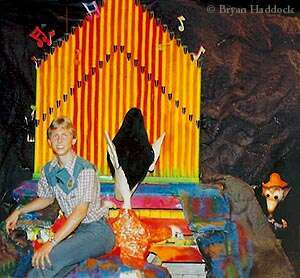 My purpose for crafting the soundtrack and documentation was to entice and help facilitate a park out there somewhere who would like to enhance their property and dazzle their guests with the magic of this very special dark ride. If only the naming of this ride were given as much effort as the design. Most Six Flags visitors called it simply "The Cave", as that is all it'ssign spelled. A spelunker is one who explores caves. Someone with Six Flags decided to add an "e" to spelunker making it a long "e" sound and changing the accent to the "spee" syllable. So, how do you spell it? Ithas been spelled, "Spee-Lunker", "Speelunker", "Speelunkers", "Speelunker's", "Speelunkers'"... youget the idea. Those searching for it on the 'net have to spell it several ways to view all pages on it. The Google search engine will always ask; "do you mean spelunker?" 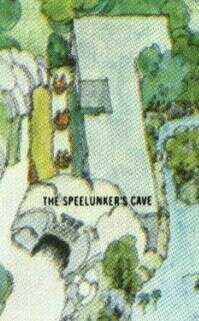 I have included a scan of the official Six Flags logo-type which calls the ride "The Spee-Lunker Cave". The characters are called "Spee-Lunkers". Oops! If you look at the map detail, it says "THE SPEELUNKER'S CAVE" (the map artist just did not get it.) O.K. you slumping Six Flags goers out there who have mispronounced or misspelled it all these years (myself included). Let's finally get it straight. Repeat after me: "The ride is called, 'The Spee-Lunker Cave'. The odd-looking characters are called, 'Spee-Lunkers'." Got it? Good! 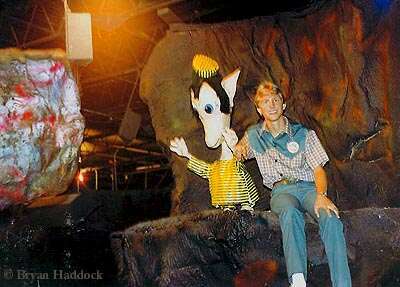 Walt Disney was invited by Angus Wynn to see his cave ride. Walt rode it and went home furious that this Texas oilman had "one-upped" him. 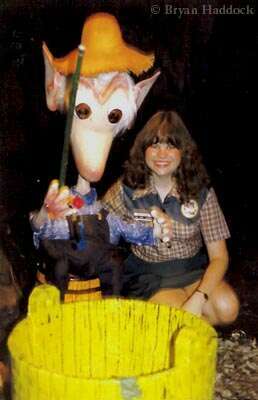 Shortly afterward, Disney introduced Animatronics. "The Cave" also was home to nutria. A former employee made an audio recording ofthe entire ride. When played back, a spooky human voice was heard in the background about where the rotating barrel was (he cannot locate thisold tape). A piece of cave "wall" is still standing, hidden behind a set in the current "Yosemite Sam" ride. The original Spees and props had to be replaced as they contained asbestos. The original Spees and props had to be replaced due to fire damage. Scott L. Jordan of amusementpark.com, Bryan Haddock, Alan Reynolds of Six Flags Over Texas Former Employees Contact Page, GenePatrick, Gary Persons. This article ©2002 Barry K. Green and used with permission. Photos ©2002 Bryan Haddock,and Tim Hollis - used with permission. Un-credited photos are from a 1968 Six Flags brochure.